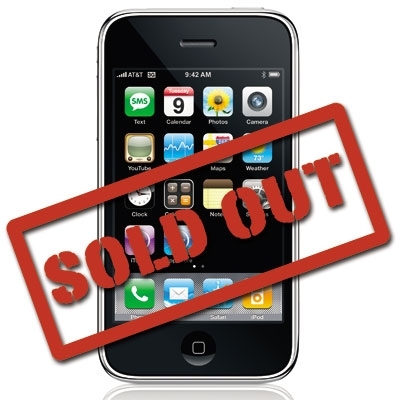 It is being announced that AT&T has officially sold out of their allotment of iPhone 4 pre order inventories. So you might have been thinking that the AT&T website was down due to traffic to the site – which very well may have been. But it is also possible that the AT&T website was down to make the necessary changes to remove the iPhone 4 pre order links. So now I think we can officially say that Apple was not quite prepared with their inventory for pre order demand here in the United States. This is also evident of the fact that white iPhone 4’s were never available to begin with. I am currently unsure as to the inventory status of iPhone 4’s on the Apple online store. Currently, if you visit the Apple store there isn’t any links or indication that they are out of iPhone 4 pre order supplies. Read a little more carefully. "As of Tuesday afternoon, customers who preorder iPhone 4 moving forward will receive their device on June 25 or later,". If you pre0ordered before this, you should get it it on the 24. That is what I got from reading this. I was pissed when I was forced to do a "manual" order by filling out a form and handing over my credit card info in hopes that my AT&T rep would be able to process the order at a later time. Technically I ordered mine well before noon, but if that rep was not able to place the order until after 4:30pm then I'm in the same boat as all the other later orders. However, even after I placed that order, I kept hammering Apple.com to see if I can place the order myself through there and it appeared as though each time, I was not able to place an order for the replacement (which needed AT&T's servers to verify my account), but I was able to reserve my phone at the retail price. I assume had I done this, I would have been able to verify my account when I picked up the phone and got the discounted price. But I didn't want to do that, so I kept trying and trying and finally I hit it! I was able to place the order around 4:45pm from Apple.com and got my confirmation email about 45 min later. In the email I got an order number and I verified my bank statement and I was already charged for the phone.